In 2018 the Sainsbury Centre for Visual Arts will celebrate its 40th anniversary. Opened in 1978, the building was both Sir Norman Foster's first public commission and a new paradigm in museum design. The Sainsbury Centre forms part of one of the last, great phases of modernism, combining structural integrity and precision engineering with a radical approach to the integration of services. 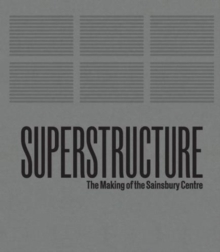 The publication will be released to coincide with the opening of Superstructures: The New Architecture 1960-1990, a major exhibition that will situate the Sainsbury Centre within its historical context and will explore architecture's fascination with new technology, lightweight structures, building techniques and engineering solutions that emerged in the post-war decades, eventually redefining the spaces of culture, work, travel and living. Contents of the book include essays by Jane Pavitt and Abraham Thomas, curators of the show, and an interview to Sir Norman Foster conducted by Jonathan Glancey. An extensive photo essay will feature a range of unpublished photographs of the building under construction.